The cracks on the road on the infamous hill are deeply etched into the tar. Years of weathering have deepened them into vivid lines that scar the road. Long ago on a bend in the road someone painted the word “Sweethoogte” (sweat heights) in now faded enamel paint. In autumn the sun sets low and intense over the hill, bathing everything in an ethereal orange glow. And every April Comrades Marathon runners pound up and down the hill, honing their fitness and hill climbing strength for the great challenge of the hills. Time and age have faded many of my memories of the first Comrades I ran in 1977 but I have never forgotten the struggle I had on little Pollies, nor the radio broadcast I listened to as I tried to summit that awful hill. For those who are not familiar with the Up run, Little Pollies is a long double-headed hill that confronts runners at their weakest moments. At the summit of Little Pollies lies the village of Ashburton. There are about 13 or 14km still to run in the race and the monster hill, Polly Shortts, lies ominously ahead, the prospect of which poisons the minds of even the strongest runner. Novices and inexperienced runners are often fooled into believing Little Pollies is actually the real Polly Shortts. There are no words to describe the mortal blow an inexperienced runner receives when the truth sinks in. However in 1977 I knew exactly where I was on the route and despite my best intentions I was forced to walk on little Pollies. After a few minutes of slow walking I broke into a slow shuffle and managed to persuade my exhausted legs to shuffle one lamppost and then walk one lamppost. I knew more torture awaited me on Polly Shortts and to add insult to injury a spectator’s radio broadcast the conclusion of the race. The dejection I experienced that day haunted me for weeks afterwards. Perhaps arrogantly I had assumed beforehand that I would not walk one step of my first Comrades. Little Pollies humbled me. I decided to approach the Wits University running club veterans for advice. 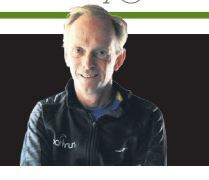 It was Brian Chamberlain (Two Oceans Marathon champion in 1977 and 1978) or Dave Hodgkiss who counselled me. “Fordyce, we think it’s time we introduced you to Sweethoogte,” I was told. And so I met the hill that was to serve me so well over the years. It was to become the training session I would run most. I must have stared into the setting sun on that hill hundreds of times. That first evening we ran 4 or 5km to Sweethoogte Hill. We then ran eight repetition sprints up its viciously 410m steep incline, recovering again for the next sprint each time we jogged back down to the base of the hill. Over the years I learnt that eight repetitions in 1 minute and 30 seconds was good running and meant I was fit. Repetitions in 1 minute and 20 seconds meant I was possibly ready to win the Comrades. Of course, every Comrades runner needs to train on hills and build hill strength. After all, apart from the challenge of running the five great named hills (Cowie’s, Field’s, Botha’s, Inchanga and Polly Shortts), the first half of the Up Comrades is so testing that most marathon runners will never run one single standard marathon as hilly and tough at another venue. Every runner is aware of the advantages of training on hills. Hill training builds leg strength, endurance and wonderful cardio-vascular fitness and the risk of injury is far less than other anaerobic training sessions. Most importantly it builds hill running confidence. The gift that Sweethoogte gave me was to convert what was once a weakness into a strength. To this day I consider myself a strong hill runner. In the early weeks of the Comrades training build-up runners should have been looking for hills, choosing routes with plenty of climbs, embracing the ascents. My good friend Kirsty Brits and her fellow Swakopmund Striders live in billiard table flat Swakopmund in Namibia. Kirsty has shown me how her running friends regularly drive 40km inland to the Goanikontes Mountains to ensure they run hills as often as possible. The Walvis Bay runners drive as far as 70km to find hills. As we head to the end of April specific hill training sessions like Sweethoogte start to become increasingly more important. I recommend a short 4 or 5km warm up followed by a session similar to the one I ran (five to 10 repetitions on a steep hill of about 400m). Too many repetitions, or selecting a hill that is much longer than 400m results in the session becoming counter-productive. Longer hills reduce a runner to a crawl and merely repeat what runners experience on a day-to-day basis on hilly courses. It is important to stride strongly up the hill on each repetition, concentrating on form and style. The renowned running coach, Bill Squires, who famously coached four-time Boston and New York Marathons champion Bill Rodgers was an enthusiastic proponent of hill repeats for his athletes. He encouraged them to picture themselves pulling on two imaginary parallel ropes as they tackled a hill. I always insist on a cool down jog after any hill session. If the session has been run honestly any hill encountered on the cool down jog should feel like Mount Everest. As the Comrades Up run on June 9 draws nearer I believe hill sessions should now be run on a weekly basis. As race day approaches I prefer to reduce the number of repetitions I run but to increase the speed and intensity. My own hill sessions became a vital and regular part of my training week. And two years after my compromise walk/run strategy on Little Pollies, I ran strongly up and over that hill en route to third in the 1979 Comrades. And just as Dave and Brian and the Wits veterans had introduced me to the most important hill in my running life, so I too led many new runners to that steep and winding road. I remember being dropped for dead in 1993 by Wits team-mate Mark Plaatjes when we trained on Sweethoogte. That evening I ran several repeats in 1:18 to 1:20. Mark averaged 1.13. A few weeks later he won the World Marathon Championships in Stuttgart.